the before t-shirt was pretty cool: bright colours, with a comic book theme. 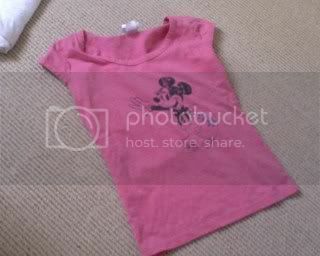 but i didnt like how it was JUST a t-shirt (too many tshirts in my closet ). 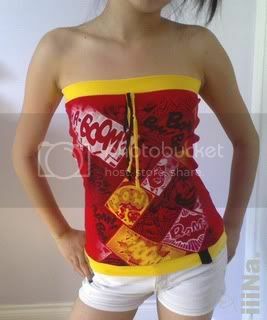 i added yellow edges on top and bottom and turned it into a tubetop! then cut yellow and black scraps into strips so theres some deco in the front! another new shirt i got at the disney store on sale! 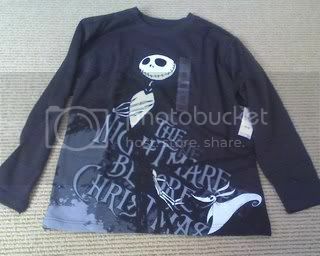 it was a long sleeve child's medium (didnt fit me of course), but i love jack too much to pass up the cute design! before: my sister's pants that she barely wore. 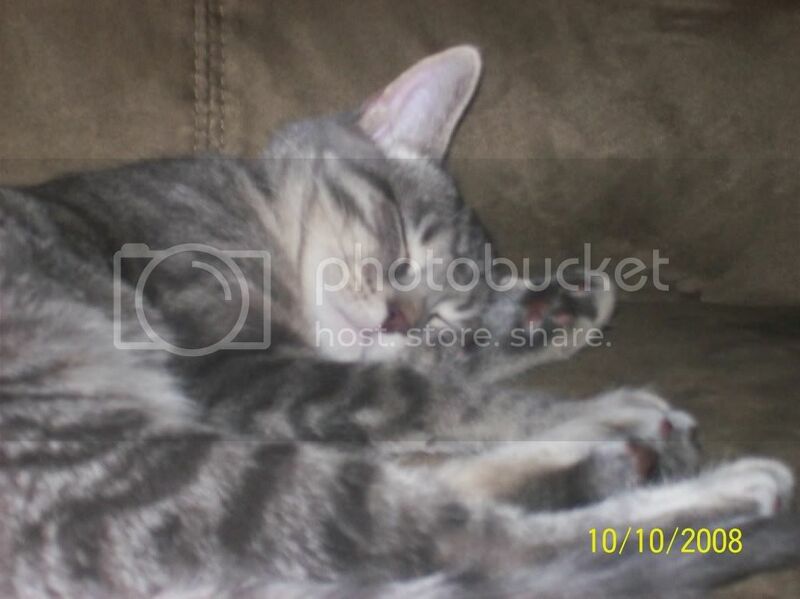 i forgot to take a before pic, but its the exact same as this, but with pink stripes. after: the shirt is made up of 6 panels + 2 for bodice. cut off the leg part of the pants and sewed it together. then fitted it with darts. used left overs for the bodice and straps. the straps actually have lace detail, but i forgot to take a close up. the back is my fav, it dips into a 'v' - made possible bcuz the back is actually made of 4 panels! 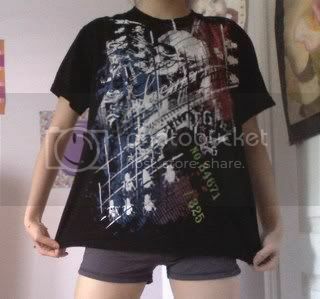 before: another brand new huge shirt from the guy's section. i love the design of the shirt: skulls, bugs, and paint splatters that brighten up the black! after: made it into a tank! one side has straps that tie up (adjustable of course!) and the other side has 3 straps that go along the shoulder. ***this was more of a for-fun/ experiment. i didnt really know what i was doing- LOL. tell me what you think, keep? or cut up & use for scrap fabric? These are all great! I like the asymmetrical straps. ROCKIN!!!!! You are sooo bookmarked! Thanks for posting these!! GREAT JOB! and the mens shirt into the halter...LOVE love LOVE it!! I also love the skirt at the end!!! Good work! 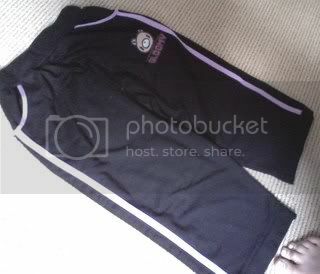 I love the jogging pants shirt. That Mickey mouse skirt looks a bit tight though. These are some great recons! I think I like the one with the asymmetrical straps (three on one side, and the tie on the other) the best. But can I make it out of clay? 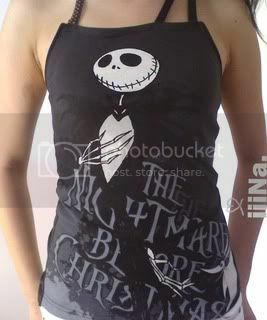 Big fan of the Nightmare Before Christmas shirt - love the use of the D-ring in the back. Everything is super cute!